Happy Birthday to You Dumitru! Cutting the cake "statistically random." Today was no ordinary day. We had the pleasure of celebrating the birthday of our favourite person from Moldova! Dumitru has already lived quite the life. He started three successful businesses before the age of twenty-two; studied for his PhD under the students of the first Soviet scientist to launch a rocket into space; emigrated to Canada with his wife; started a family with two wonderful children; and co-founded Stream Systems. 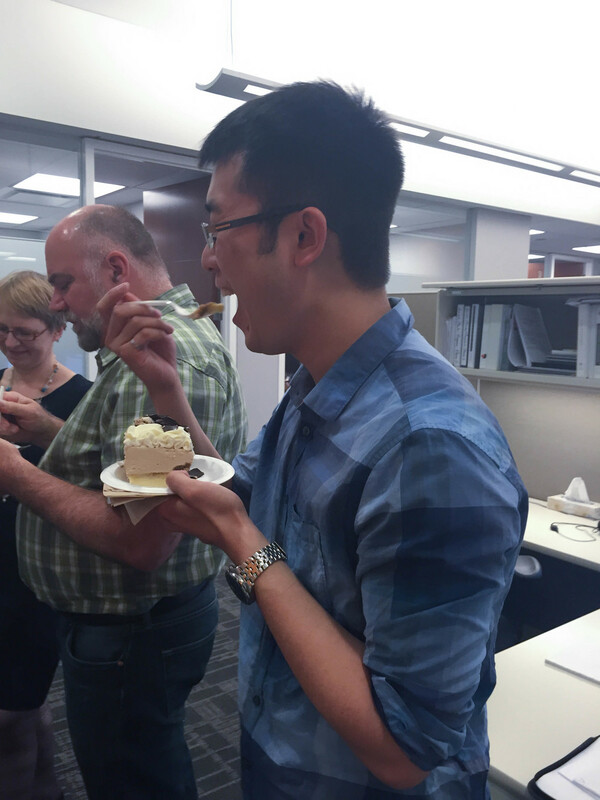 Luckily for the office, Janette brought an amazing Tiramisu cake to celebrate. Dumitru’s method for cutting the cake was “statistically random”, so we were gifted with slices as big as our hands. Dumitru’s Mother-In-Law also made delicious, cherry filled pastries with cinnamon and sugar using a secret recipe from Moldova. Thank you for the treat!